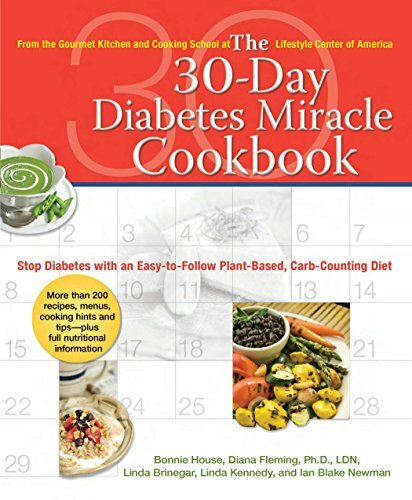 The indispensable companion to The 30-Day Diabetes Miracle, featuring more than 200 recipes to help stop diabetes and reverse many of its effects. With more than 200 vegetarian and vegan dishes, and an emphasis on "good carbs," plus menus, helpful tips and advice, and full nutritional information, this cookbook will help people with Type 1 and Type 2 diabetes eat and live well. From breakfast dishes to desserts, every recipe has been created to be low glycemic, low fat (and trans-fat-free), low sodium, and cholesterol-free. Also included are: substitution charts to help readers make the transition to a plant-based diet, a glossary of cooking equipment, an appendix of cooking terms and techniques, and a list of uncommon ingredients with brand name recommendations. Product Description: The indispensable companion to The 30-Day Diabetes Miracle, featuring more than 200 recipes to help stop diabetes and reverse many of its effects. With more than 200 vegetarian and vegan dishes, and an emphasis on “good carbs,” plus menus, helpful tips and advice, and full nutritional information, this cookbook will help people with Type 1 and Type 2 diabetes eat and live well. From breakfast dishes to desserts, every recipe has been created to be low glycemic, low fat (and trans-fat-free), low sodium, and cholesterol-free. Also included are: substitution charts to help readers make the transition to a plant-based diet, a glossary of cooking equipment, an appendix of cooking terms and techniques, and a list of uncommon ingredients with brand name recommendations.